Output power rating: 500VA ~ 90kVA. Capable of Power Line Distortion simulation. Harmonics and inter-harmonics waveform function. Meet IEC 61000-3-2/3-3/4-11/4-13/4-14/4-28 test requirements. The AC+DC modes extend the applications not only pure AC voltage but also DC component for testing DC offset in laboratory. Applying the advanced DSP technology, the 61500 series is able to provide precision and transient voltage waveform as well as measurements such as RMS voltage, RMS current, true power, power factor, current crest factor and up to 40 orders of current harmonic components. With the versatile programmable vol tage functions and easy-use operation software, the 61500 series enables users to per form the pre - compliance tests against IEC 61000-4-11 and compliance test against IEC 61000-4-13/-4-14/-4-28 immunity test regulations. With low impedance and low voltage harmonic character, model 61505 can be a standard source for 230V/16A IEC 61000-3-2 testing. With programmable output impedance function, 61500 series provide a solution for testing IEC 61000-3-3 regulations by incorporating a flicker meter. Chroma 61500 series provides powerful functions to simulate all kinds of power line disturbance conditions. The STEP and PULSE modes offer a method to execute a single step or continuous output changes. The LIST Mode, up to 100 sequences, extends this function for more complex waveform generator needs. 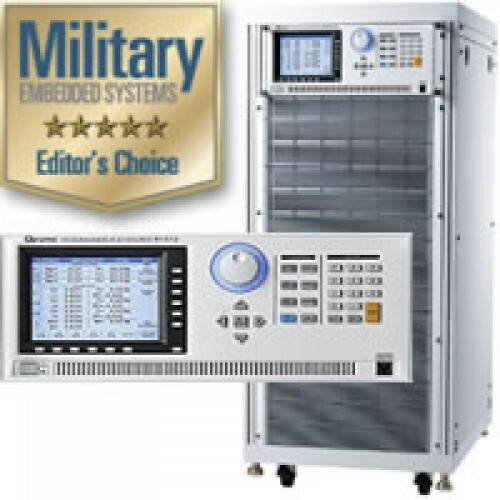 In this way, 61500 series is capable of simulating all sorts of voltage dips, cycle dropout, transient spike, brown out for IEC 61000-4-11 pre-compliance test and IEC61000-4-14 and IEC61000-4-28 compliance tests. 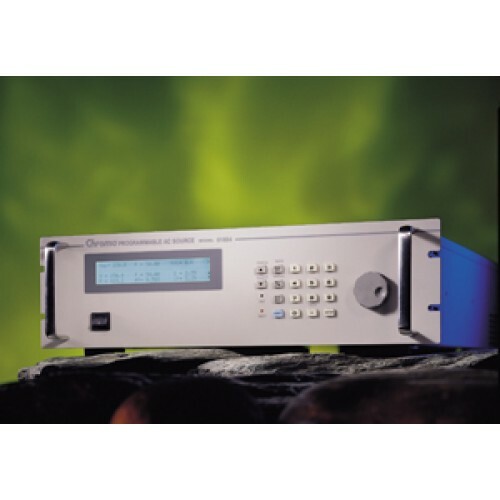 Chroma 61500 series allows users to composite up to 40 orders of harmonic components for synthesizing a distorted voltage waveform with SYNTHESIS function. It also provides INTERHARMONIC function for programming sweeping interhamonics component from 0.01Hz to 2.4KHz. It can help to find the resonance or the weakest points of UUT. It is capable of generating a periodic harmonic and non-periodic harmonic distorted waveform to perform IEC61000-4-13 compliance test. 61500 series AC source provides a 3-PHASE mode to let users connect 3 units for 3-phase output application. The Master unit will keep on Fixed mode and send a signal for synchronizing Slaves. Users can connect 2 units of 61500 in series and set the phase angle to zero (see figure) in 3-PHASE mode. In this way, users can program a 220V/0.5sec superimposed on 230V to get a 450V transient voltage easily. 61500 Series provides a graphic control software. It can help users to run all functions easily. It also includes IEC test standards and a report function for recording measurement data for a period of time in a file. 61500 series can be used to test aircraft electrical equipment. Chroma also provides software for AC power part test of standard RTCA DO-160D , MIL-STD-704F and ABD0100.